Zortrax M200 Review: Is this the Best FDM Printer? The Zortrax M200 Pro printer is among the best 3D printers in the industry thanks to its exceptional print quality. 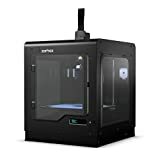 Zortrax’s reputation for producing reliable FDM 3D printers is augmented with the M200 Pro. Objects produced with this printer are seamless to a point where you can barely notice any layering. Besides loading some filament, you will not be required to do any complicated setup of the M200. This makes the M200 Pro a truly plug-and-play printer. If comparing this 3D printer with existing technology, it would be similar to Apple products. You switch it on and it functions flawlessly without any additional tinkering needed. On the XY axis is a moveable print head that offers incredible precision with its direct feeding head up to 1.5 microns. The build plate moves in the Z axis and has a precision of 90 microns. This printer has a solid feel that comes from the aluminum chassis. It gives the printer a high quality feel together with its excellent selection of components. If you are an experienced 3D printer user, you probably know that it’s often times hard to get the first layer on the build plate to stick. However, the Zortrax M200 has an innovative feature that makes it easy for the build plate to stick. There are different ways in which you can make the initial build plate to stick on a 3D printer. Among the solutions is using blue painter’s tape or using Elmer’s glue. With the Zortrax printer, there is no need to use any of the solutions to get your object to stick better to the build plate. The plate itself absorbs a little bit of the material when it melts away into the holes of the plate. This eliminates the need for using any manual conventions to help your model stick to the build plate. This unique build plate feature saves you a lot of time and enables you to start printing even sooner with the Zortrax M200. Printing a filament like ABS it often hard when you have an open chassis. Unlike some of its rivals, the Zortrax M200 3D printer ships with a fully enclosed environment. This allows you to produce high-quality prints reliably and repeatedly. The printer has a generous build volume of 200mm x 200mm x 180mm. Most 3D printers available on the market require some initial setup process to run smoothly from the first print. After the setup, you might still have to tweak them from time to time to get the same results. The M200 is different in regards to this. The M200 printer provides incredible prints from the first time you switch it on. This level of details and reliability can be seen throughout its lifespan. Some 3D printers require some tweaking on a daily basis but this is not the case with the Zortrax M200. This printer automatically levels the printing bed and you would not have to change these setting for months of continued printing. You don’t need to use any tape or glue to get your initial layer stick to the build plate. The problem of the build plate not sticking is not there with the Zortrax printer. This M200 3D printer has a slight advantage over its rivals with its XY layer height of 1.5 microns. The printer has a standard minimum layer height of 90 microns. The build layers are barely visible to the human eye because the print quality is exceptional compared to some rival FFF printers. Zortrax has used high-quality components in its 3D printer. This can be seen the moment you switch it on. There are no parts moving around or making loud noises or vibrations. Many users of this machine have reported near zero build failures. Most people are happy with the perfect build plate that comes standard with this printer. Zortrax provides excellent-quality filaments for its machine. Not only is this printer reliable and provides good quality prints but also ensures that you get the best out of your filament through the Z-suite of software. You can use different types of Zortrax filament or colored filament with the printer. Optimizing your printer can be difficult and frustrating at times. However, Zortrax has done a good job by doing optimizing the printer themselves. The preceding M200 Zortrax printer models had a number of downsides. For example, you were restricted to only using the filament provided by Zortrax. Things have been changed with the M200 Pro as you can now use off-brand filaments. The software also accommodates this move through the warranty update. Unless you want to achieve a specific finish or use a specific color, you would find the Zortrax range of filaments more than satisfying. They come at a reasonable price too. Besides printing a wide array of materials, you can also print some of the exotic filaments such as the Z-ASA PRO (this is mostly used outdoors), Z-Glass (this material merely tries to mimic the properties of real glass) and Z-Hips (a matt like material that creates a real smooth look). Some 3D printing enthusiasts prefer assembling their printer and tweaking it up until it works perfectly. However, most people don’t like this process. The M200 provides a flawless experience to many 3D printer consumers. Most of the tweaking is already done by Zortrax. You simply need to plug in the M200 and start printing. If you like to tweak and improve your printer, you should look for another model. The Zortrax M200 Pro 3D printer provides reliable prints and continues to do so for months without the need for recalibration. 3D Tech Valley Copyright © 2019.